Carlisle Interconnect Technologies has advanced the design of traditional push-on RF connectors with a new line of locking push-on connectors, the SMP-L™ series. This new series of connectors addresses the needs of RF system designers whoare looking for a blindmate interconnect solution that can withstand harsh mechanical stress, primarily in rugged military/defense applications such as radars, missiles, handheld radios, avionics and UAVs, as well as for a growing number of commercial uses. The SMP-L connectors are available in cable, PC board or panel configurations for use within microwave modules and subsystems. The introduction of push-on blindmateable connectors, such as the Sub Miniature Push-on (SMP), galvanized the RF/microwave industry as their use enabled designers to increase package density by stacking PC boards and thus reducing their form factor, while also simplifying the assembly and test of these designs. Since then, SMP and other push-on connector types have become the interconnect system of choice within RF/microwave systems. Generally, push-on connectors utilize a push-on or friction-fit mating, or sometimes a snap-on mating to ensure a suitable connection. While a number of factors contribute to the overall performance of these systems, signal integrity issues at the connector level typically arise from any coupling or de-mating problems at the interface, including any alignment issues with respect to the socket (female)/ pin (male) components. Under somewhat vigorous use, including harsh environments that are subject to significant movement or vibration at the connector interface, such conventional push-on architectures may not perform well. Furthermore, there are certain applications where push-on connectors are required to remain mated even under the tensile strain of the cable coupled to the connector. The SMP-L series adds a patent pending positive-locking mechanism referred to as Secure-Lok™ onto a standard SMP interface to improve upon the ruggedness and repeatability. The female SMP-L connector interface adds a movable collar onto and rearward of the push-on socket, which includes a pair of bayonet pins. The male SMP-L connector interface adds a second bore onto and in front of the push-on plug, which includes a latch to accept the bayonet pins of the female interface (see Figure 1). Figure 2 SMP-L locking mechanism. Figure 3 Typical performance of P657SL-3CC (cable connectors) measured on Accuphase TLL40-1111A flexible cable. When the female interface is inserted in the male interface and rotated clockwise, the bayonet pins slide along the inclined latch surfaces to axially drive the collar into the receiving bore to secure the female connector onto the male connector (see Figure 2). To disengage the locking mechanism, the collar on the female interface must be pressed in and rotated anti-clockwise to de-mate the connectors. Consequently, the retention mechanism of this design improves upon a push-on connector’s ability to resist unintentional de-mating forces, and to maintain signal integrity under adverse operational conditions such as heavy vibration. The SMP-Lconnectors retain the electrical performance characteristics of their SMP equivalents, and thus are an excellent fit for RF/microwave systems operating up to 40 GHz. The coupling retention mechanism, Secure-Lok, improves the retention force to > 100 lbs when measured on a 0.085" cable. This ensures that a reliable connection is maintained between the male and female interfaces even in harsh environments where a standard SMP interface with detent can possibly lose mating. 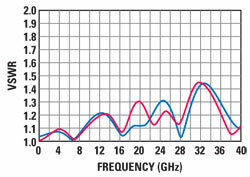 The SMP-L interface specifications are listed in Table 1 and typical VSWR performance to 40 GHz is shown in Figure 3. In addition, durability tests were performed during the qualification phase to ensure that repeatability is maintained over 500 mate/de-mate cycles. The SMP-L family comprises of female cable connectors and their male PCB and panel receptacles. These SMP-L connectors are fully compatible with the standard SMP connector line, which includes bullets, adapters, panel mounts and field replaceables. Thus, a complete interconnect system is available for new designs that also maintains compatibility with the existing SMP standard interface that is commonly employed in RF/microwave systems. Additionally, Carlisle has designed a variety of SMP-L connectors, including IP67 compliant configurations, specifically for its customers’ application needs. Hence, SMP-L connectors are an ideal solution for applications that require the performance and density of a push-on connector with the ruggedness of a locking feature. Their superior performance under vibration and other harsh environmental factors allows designers to overcome the historical limitation of using only threaded connectors such as the SMA or Type N in their designs. Moreover, the compatibility of the SMP-L connectors with the standard SMP interface enables the use of a single interconnect system throughout the design.